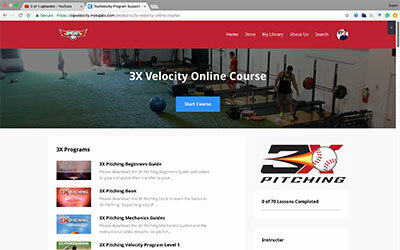 This online course was not only developed to simulate the famous 3X Velocity Camp just outside of New Orleans, LA. It was developed to also to be the most successful Pitching Velocity Program you can find and it has proven to do just that. In its beta version, it has shown to increase the success rate of those following the 3X Pitching Velocity Program by 146%. That is an amazing improvement to the success rate of these programs. If you haven’t already, check out all of the 90+mph testimonials from the 3X Pitching Velocity Program. This is the most successful pitching velocity program online. If you have not learned about the revolutionary science behind the program then check out the home page here to learn all about it. In the information following below, you will learn the layout of this unbelievably effective system and what is included in the online course. Once you purchase the Online Course below you will receive an email with the login info to your personal account. The first screen you will come two when you log in is the dashboard that you see here. 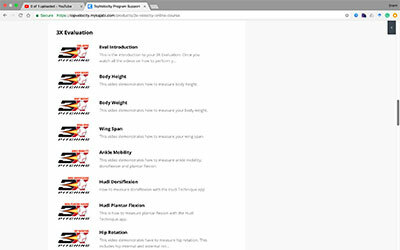 The third tab on the Online Course is full access to the 3X Evaluation where you will learn to measure your current anthropometrics and performance movements. You will then submit this information to learn your mobility and performance strengths and weakness to be used as a focal point as you train through the program. 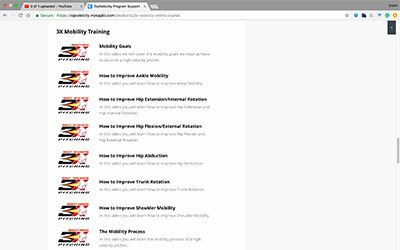 The fourth tab on the Online Course is full access to the 3X Mobility Training. This includes how to measure and improve joint mobility. It first gives you the elite ranges of the high-velocity pitchers then follows with the tools and steps to measure all of the ranges. Finally, it gives you exercises to follow to improve your ranges. Introduction to both the Mobility Course. All of the elite ranges of high-velocity pitchers. How to measure all the joint ranges and the best and easiest tools to use. Exercises to use to improve joint ranges. 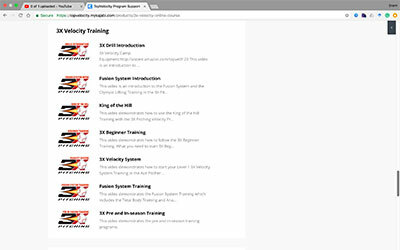 The fifth tab on the Online Course is full access to the 3X VTraining. This includes how to start and effectively follow your Off-Season, Pre, and In-season 3X VTraining. It will go over everything you need to how to best set your maxes for your Fusion System training. How to Start and Following the Level 1 Mobility, 3X velocity System, and Fusion System training. Level 2 and 3 Off-season VTraining are not included in this section. This is an upgraded level of the Online Course. You still have full access to the Level 2 and 3 manuals and instructional videos. 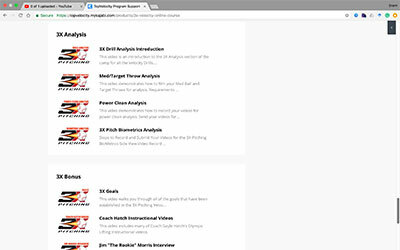 The sixth tab on the Online Course is full access to the 3X Analysis. This will show you exactly how to film and submit all of your videos for analysis. It will also show you how to record your progress through the 3X Programs so Coach Brent can monitor your progress for support through the program. The seventh tab on the Online Course is full access to all the 3X Bonus material. This includes many great interviews I have had with pivotal figures in the game of baseball or performance enhancement. These videos are more proof that conventional wisdom does not drive the careers of many the elite athletes and baseball players. Now is your chance to develop yourself into the elite pitcher that you have dreamed of becoming. 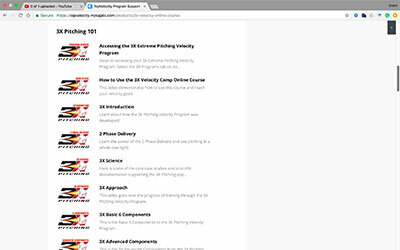 Do not hesitate to start this Online Course to the 3X Velocity Camp because you need all the time that you can find. Don’t think because this is an Online Course that the registration will always be open. I can only take on a hand full of pitchers per month. This means register ASAP to secure your spot TODAY! The number below is the number of available spots that we have left until the registration is CLOSED. Register NOW! This is for those who are not able to attend a 3X Velocity Camp. This interface will simulate the same experience as attend a 3X Velocity Camp.